We are now all familiar with the concept of the 4 C’s and their importance in preparing students for the future. As educators, we need to look for examples of how teachers are facilitating these skills every day.Here is an activity recorded in gym today that shows how students in primary and junior can communicate and collaborate together to learn a new skill and at the same time cooperate in the use of precious gym time! 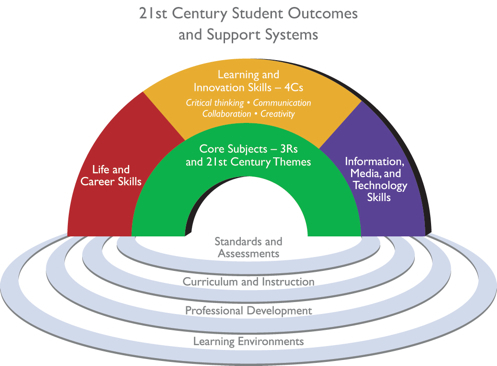 While the graphic represents each element distinctly for descriptive purposes, P21 views all the components as fully interconnected in the process of 21st century teaching and learning. Our grade 5’s working collaboratively with the grade 1 and 2 students. Thank you for sharing the collaboration video! So often we as educators talk only about literacy and numeracy. It was so refreshing to see an authentic example related to wellness. So empowering for students to help others!